On Saturday, April 14, we had a delightful and different workshop lead by Judy Rishel. It was actually a two for one type of workshop. 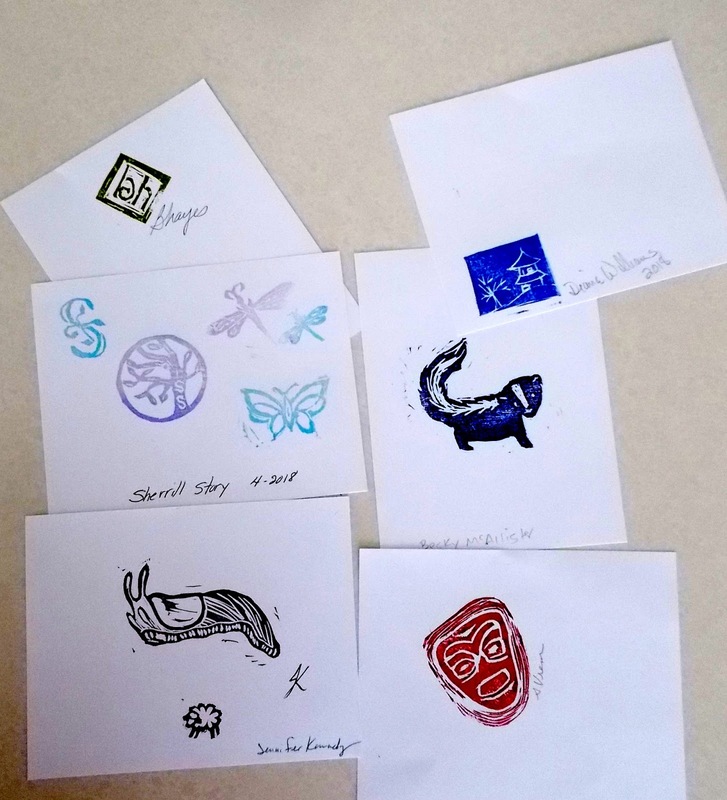 We learned about "Letterboxing" and carving stamps. We started with letterboxing. Judy brought her friend, TJ, who is a fellow letterboxing person. 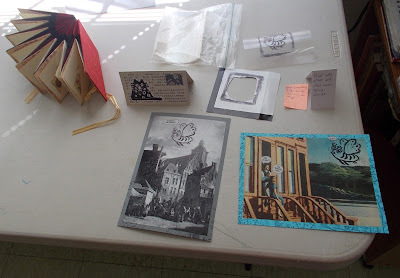 They told us that letterboxing is “like a treasure hunt type of game.” One does not look for general types of items but rather a letter box placed by another individual. Inside that letter box is a stamp (usually hand carved) and a log book. 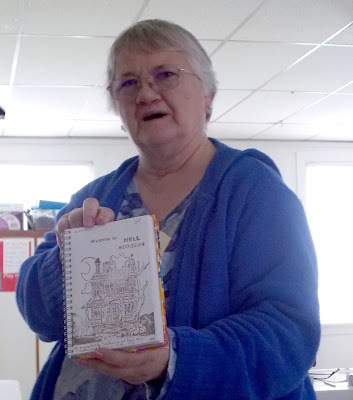 Judy carries her own personal log book which she uses to record what letterbox she found and uses the stamp she found to mark in her own book. She does the same thing to the log book she found. She then replaces the letterbox and moves on. This has become a popular activity with websites (atlasquest.com) involved that give a clue to finding your next letterbox. There are also groups who get together either in person or digitally to have fun with this. Variations are out there too. You might find a Hitchhiker box along with the regular letterbox. Take it with you to leave it at your next letterbox discovery. 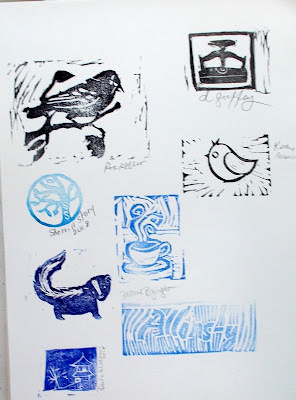 Then we settled down to making our own stamps. Some members bought materials purchased in advance by NORBAG and others brought their own. 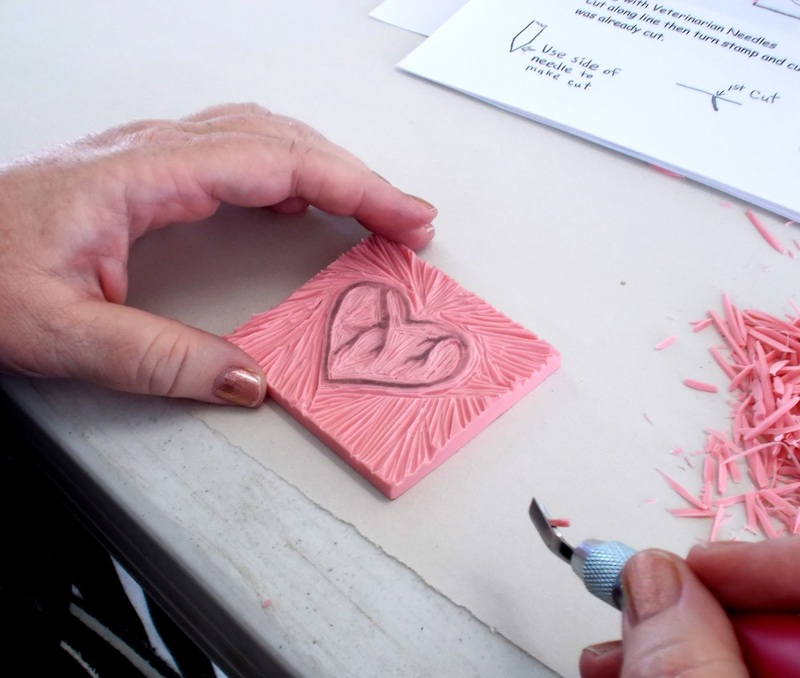 There are two generally available types of carving blocks: Speedycut (pink) and Moo carve (grey/beige), both easily carved. 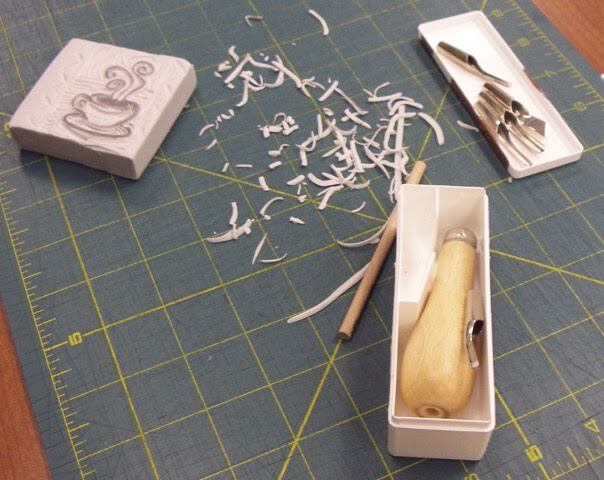 Carving kits can be purchased at your local craft or fine art stores. 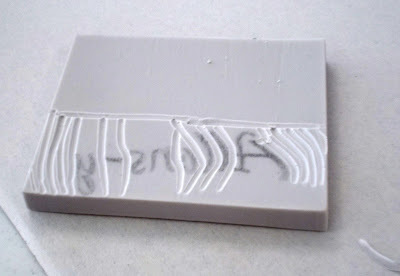 We started with two blades, first a larger U shaped cutter for larger cuts and a small U shaped cutter for finer lines. 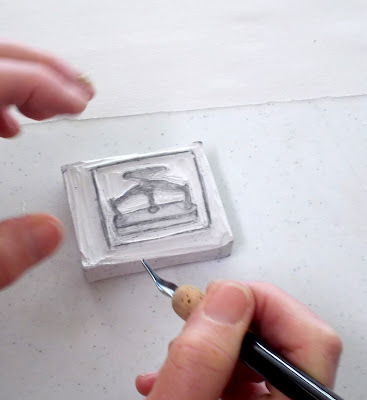 We transferred patterns to the carving blocks using tracing paper and graphite or just drawing on our stamps. Most of us started out with the tools pictured above. The Speedball starter kit includes 3 cutting tips. The pink and grey squares are the carving blocks. We brought some ink pads (with a raised surface) for testing and trading stamps. You can also see a syringe needle in the picture. Judy brought large gauge needles from the vet's office that are great for very fine carving. Judy showed the result of making a very large stamp. We aren't limited to just a little tiny stamp. These items are on our Show and Tell table. 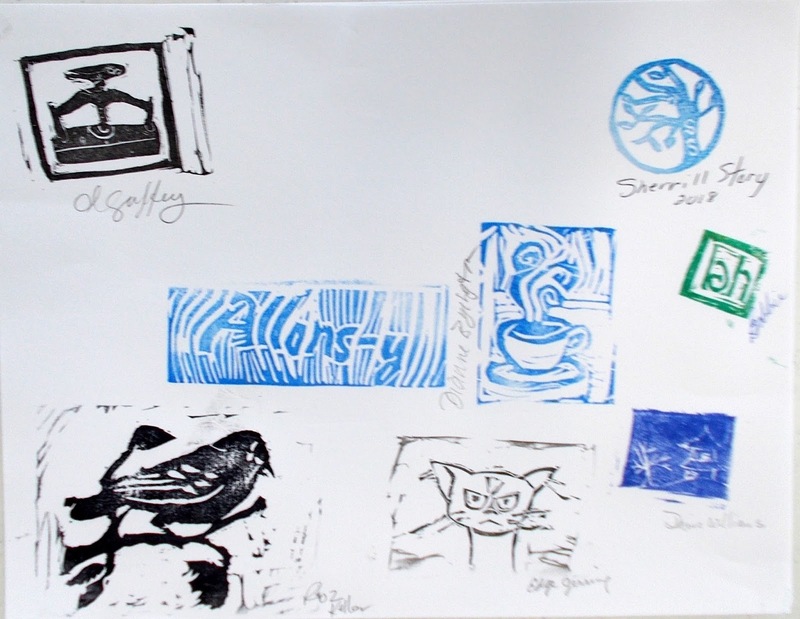 There are four novel uses for our stamps. TJ made each of us an embossed image of one of her stamps. Judy also mentioned that you could use markers to color your stamps. As usual, in NORBAG, imagination will lead you to try other things... perhaps on monoprints using a gelli sheet. 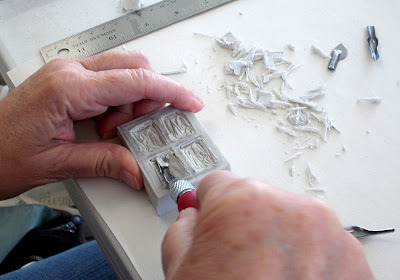 The next few pictures are simply of people working on their carvings. A little skunk. Check out the pictures toward the end and you will see it used. been used in a pen base. You are able to hold it like a pen. and numbers in reverse. This stamp made great use of the background pattern. This is a good picture of the carving tool. This is one of the fine carving tips. Using one of the wide tools to make the open spaces in these windows. This is the beginnings of a Humboldt banana slug. Here are the finished stamps. Some of these were shown above in the process of being carved. 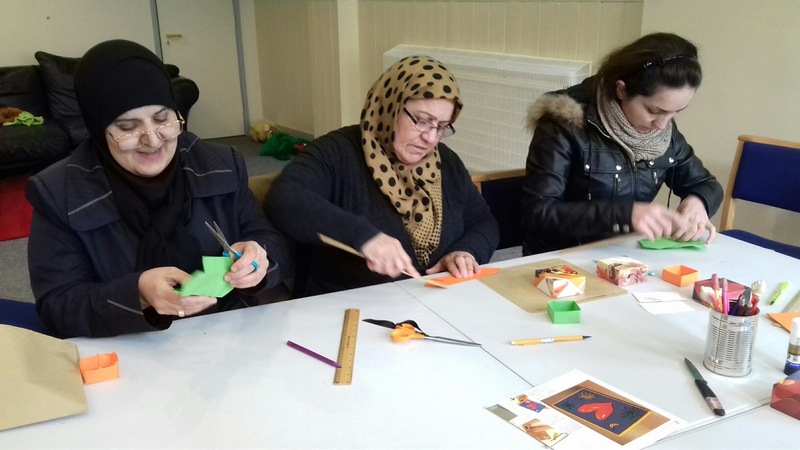 Our very busy and creative member from York, England, Margaret Beech, recently led a mini workshop for some Syrian refugees. Here is how she described the event. 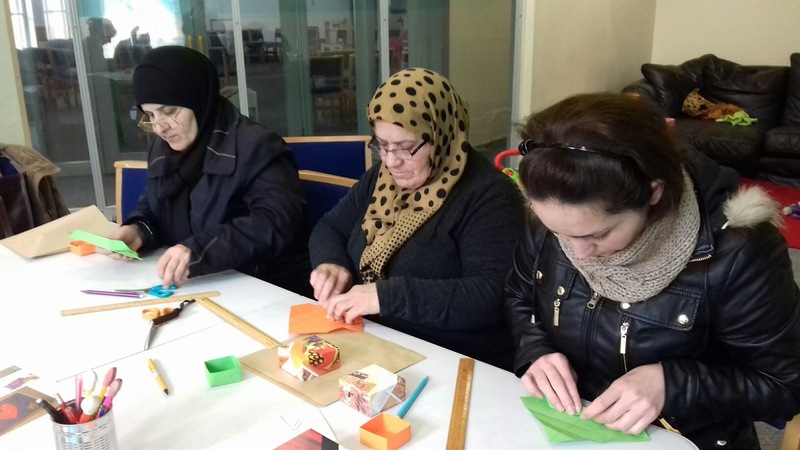 "A friend who is part of a group that supports refugees in York asked if I could do something creative for the small social group of Syrian ladies that live in York and are encouraged to get together weekly on a social basis. Not having much English they must feel very isolated. This week only three turned up but they very much enjoyed making origami boxes and talking. We even managed a small concertina book to fit inside the box too. Touchingly they wrote the names of their children on the pages. Their children seem to be scattered in camps all over the middle east. With the paper squares that were left I showed them how to make a self sealing envelope. They had very little English so I had to work through an interpreter. I gave each of them one of my little boxes full of love for themselves but they each said they would give it to their favourite child – no idea whether that would be a small or an adult child. I was so keen for them to have one of their own I gave them each another just for them. I promised that I would go again and show them some other simple paper folds and also take some of my books for them to enjoy. Even though we couldn’t communicate with a common language there were lots of smiles." What a wonderful experience this seems to have been...for both Margaret and the women who participated. It will be very interesting to hear if the women begin to get more involved with book art. Thank you Margaret for sharing this experience with us. 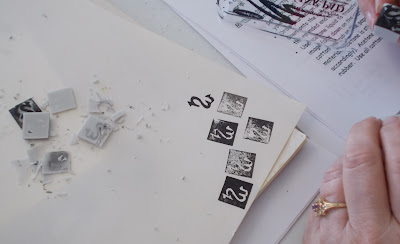 Have you had trouble finding just the right stamp to use for a project? 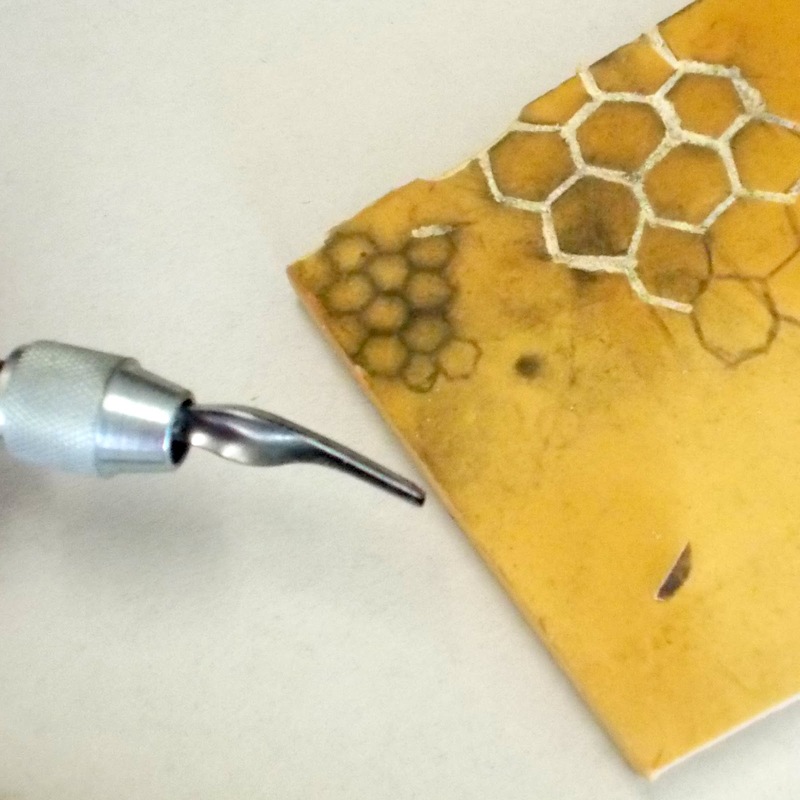 If so, the April NORBAG workshop is one you won't want to miss. 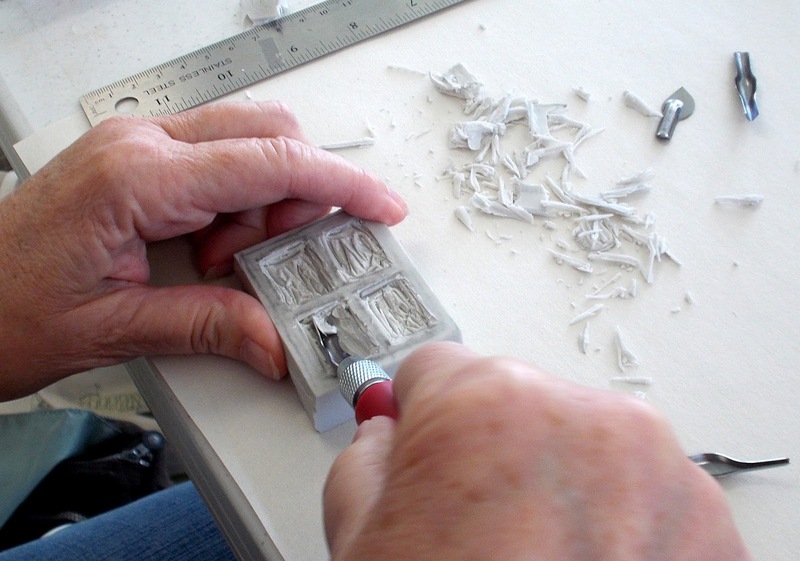 Judy Rishel will show us how to carve a small printing block. She will cover how to transfer a design to the printing block and carving techniques using different tools. 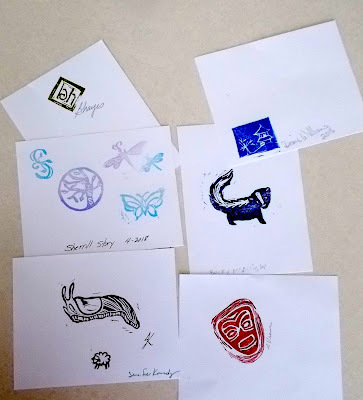 Judy will also share information about her Letterboxing hobby and show us some of her many journals filled with stamps from around the country. 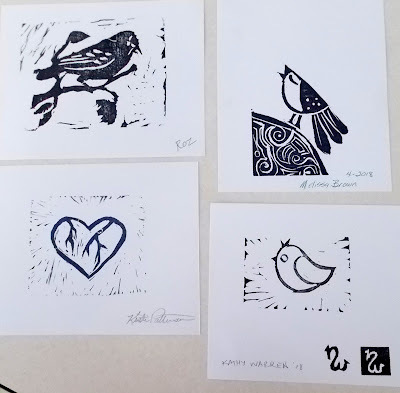 Letterboxers often choose to carve/print an image that represents themselves...such as a flower for a gardener, a bird for a birdwatcher, a musical instrument for a musician, a camera for a photographer, etc., so keep that in mind when you're thinking up an image to carve into your own block. 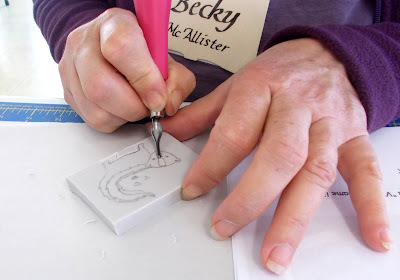 If you would like, bring a small booklet to the workshop so that you can stamp your block and other members' blocks to start your own collection. A simple image you'd like to carve that will fit on your block, best if this is drawn ahead of time in soft pencil on tracing paper. Any text will appear reversed on a block; but that problem is solved when you rub your drawing onto the block, at which time it will automatically reverse. 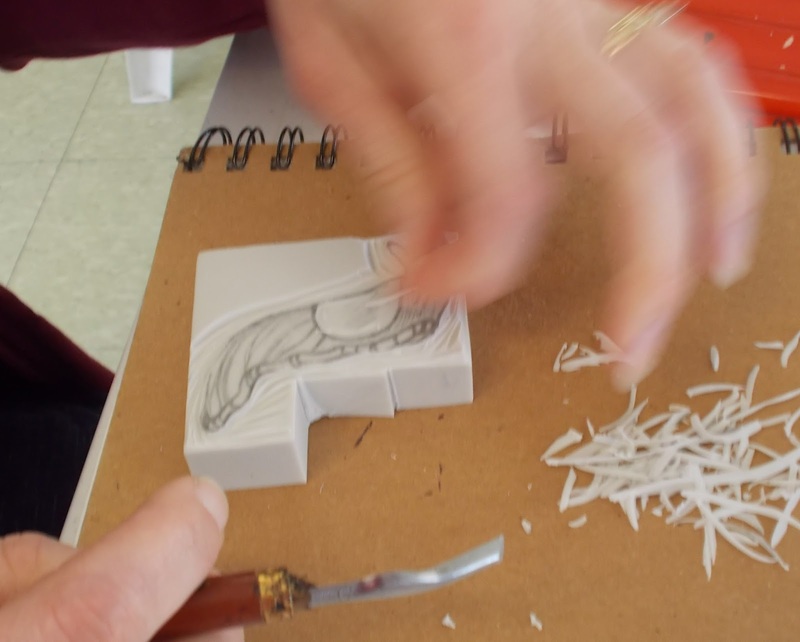 If you're uncertain, Judy can assess your image in advance of carving to make sure it's not too difficult.